Thank you so very much for your kind comments about yesterday’s fantle” ~ faux fall mantle. As promised here is the easy peasy tutorial on how to create your own spooktacular web. I opened my boxes of fall décor on Saturday and was once again reminded that all of our holiday décor was in traditional harvest colors. I was ready for something new but had no budget. So I spent the weekend painting, primping and giving all of the interior accessories a soft neutral palette. Afterwards I thumbed through the most recent issue of Country Living looking for a bit of inspiration. I really loved the “Arsenic and Old Lace feature”. I was inspired since I have an entire trunk filled with vintage and antique handiwork. Now while I didn’t have any old frames lying around I did have a handmade gift that was enjoyed all through the 90’s. (If you’re a certain age you probably had “country décor” too. 🙂 I always thought that the shape of this embroidery hoop was…eerie. So I disassembled the wall hanging and spray painted the hoop black. I rustled through my doily stash and found an small oval dresser scarf that fit almost perfectly. The lace was sandwiched between the two rings and tightened down. I propped it up against the wall and it was almost immediately proclaimed by Sweet Boy to be “awesome”. Which was quickly followed with “It needs a spider.” Which it DID! I dug around and found an old plastic spider ring and it wasn’t quite… right. I went to Michaels for some other supplies and found two glitter spiders on sale for a little over a dollar. The bonus was that their underbelly’s featured a wee spring clothespin that I easily clipped on to the lace. I thought that a grouping of “wall webs” would be fun. While I was at the craft store I did price embroidery hoops and the large specimens were around $15.00. Holy golden webs Spiderman! So I cruised by Goodwill and found an empty hoop for $1.00 and I will be on the lookout for a few more. Until then, one is fun. Love how you put this together!!! Just AMAZING!!!! Sweet Boy was right, it did need a spider! I love how quick and easy this process is. I saw one of those pointed doilies hung with fishing line draped in a corner of a store last week that had a web-like appearance, it needs a spider too. Great mini tutorial! Very nice!! The spider makes it! How creative Laura…I love how you come up with ideas with almost no budget. Of course you must keep Everything! My Mother gave me a large embroidery hoop recently; I think I should be more appreciative at the price they are at! 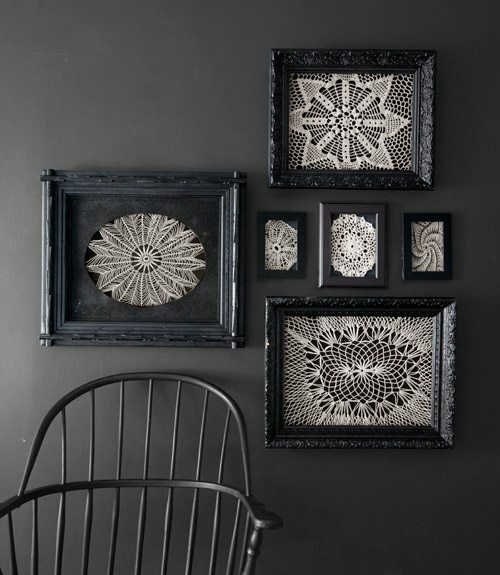 I love doilies too. I learned crochet by doing hundreds of them… during a time I even ressented because when my Aunts wanted me wuiet they would order them but I kep a few and others made by them before the vintage came along and all of the sudden everyone in the family liked them. I'm starting to think that moving with you is an experience you keep so many things, Dear Friend. So, so cool girlfriend. I love your “fantel” and I know it looks just perfect in your beautiful, adorable, home. You did a good job Laura! If you wonder at my lack of comments through the halloween faze – I don't like the holiday at all. So I usually just stay quiet! I knew immediately yesterday what your trick was! That is so cute. I don't “do” halloween, but I love the lace in the hoop! How anyone can buy anything much these days…regardless of what it is, is beyond me. I went to Walmart the other day…I purchased 4 home items…it was over $70.00! And it was just needed stuff! Next move? A CAVE! What a great idea! I've never seen anything quite like this, but I love the look! that is just too cute! and so creative! Love it! this is such a great idea, thanks for sharing this Laura! Just spooktacular! Couldn't resist, hehehe! I loooove this idea. So wonderful!! I like taking things like that and using them in different ways. Great idea thanks.